Interested in a career as a veterinarian? Here's information on educational requirements, job requirements, finding job listings, applying and acing an interview for a job as a vet. Veterinarians conduct physical examinations of animals and diagnose health problems. They devise treatment plans and prescribe appropriate medications. Veterinarians vaccinate animals. They spay/neuter pets and help with artificial impregnation of farm animals. Veterinarians treat wounds, repair bone breaks, and perform surgical procedures. Veterinarians often specialize in treating pets like cats, dogs, and birds or farm animals like horses, cattle, chickens, and pigs. According to the Bureau of Labor Statistics (BLS), employment of Veterinarians is expected to expand by 18% from 2016 to 2026, much faster than the rate of the average job. Demand for veterinary services will be driven by enhanced consumer interest in household pets and the tendency for consumers to invest greater resources in their medical care. The median annual wage for veterinarians in May 2016 was $88,770 according to the BLS. The lowest 10 percent earned less than $52,470, and the highest 10 percent earned more than $161,070. Veterinarians must earn a Doctorate in Veterinary Medicine, which involves four years of classroom, laboratory and clinical work, and meet the licensing requirements in the state where they practice. Programs are highly selective and require applicants to excel in science courses like biology, chemistry, anatomy, microbiology, and zoology. Successful applicants typically test well on the Veterinary College Admissions Test and have strong enough math skills to master science courses. Veterinarians must pass the national Veterinary Licensing Exam in order to practice. Many states also require Veterinarians to pass a state exam covering state laws and regulations. Veterinarians must have strong problem solving skills to analyze complex animal health issues and make effective diagnoses. Decision making skills are vital when selecting treatment plans appropriate for various conditions. Veterinarians should have an excellent memory to recall scientific and pharmaceutical terms. Compassion is vital when caring for animals under physical distress and attending to the emotional concerns of pet owners. Communication and interpersonal skills are required to establish rapport with animal owners and convey information in layperson's terms. Fine motor skills are essential since Veterinarians perform delicate operations and procedures on animals. Business skills are necessary for most Veterinarians since they often manage clinics, labs or animal hospitals. Types of practices include companion animal, large animal, equine, emergency and critical care, food animal, exotic animal, laboratory animal, radiology, surgery, zoological, and other veterinary specialties. Personal recommendations from professionals in the field are vital for veterinarians seeking employment. Reach out to faculty, career and alumni staff from your vet school and ask for introductions to alumni in areas of practice which correspond to your interests. Visit these individuals if possible for informational consultations and ask for advice about establishing your career. Reengage past clinical supervisors and seek their input about your search. Approach your undergraduate career and alumni offices and ask for the names of alumni practicing veterinary medicine to contact for informational interviews. Join general professional organizations like the American Veterinary Medical Association and network with fellow members at conferences and through online groups. Google "Veterinarian Associations" for names of specialized associations related to your areas of interest and engage those members. Ask your Vet school faculty for the most appropriate groups for you. Search specialized veterinary science job sites. Also search job sites like Indeed.com and Monster.com using the keyword "Veterinarian" to generate additional leads. The Vet Recruiter is a search firm which connects Veterinarians to potential employers in the field. Identify animal hospitals/clinics, research facilities, government agencies and other veterinary employers in your preferred geographic area. Contact them directly regarding any vacancies since their positions may not be posted at the sites where you are looking for jobs. Visit some of the facilities and engage the managers to show a special interest in working with those organizations. Research the orientation of the facility for which you are interviewing. Be prepared to answer questions regarding that type of veterinary practice. Expect questions about challenging situations which you encountered in your clinical rotations. Prepare examples of cases/situations which challenged your diagnostic and interpersonal skills. Interviewers for veterinary positions often ask hypothetical questions about ethical dilemmas or difficult interventions. Often there is no right answer to these questions, so focus on presenting a viable rationale for your position. 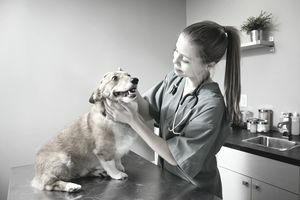 Think of six to eight reasons why you would be an effective veterinarian for the type of organization for which you are interviewing. Consider assets like specialized knowledge, clinical achievements, personal qualities, and skills. Prepare an anecdote or example for each asset demonstrating how you successfully applied that strength in an academic or clinical context. Most employers will be interested in your ability to service clients and generate return business. Be prepared to address how you have engaged pet/animal owners and secured repeated billings. Effective follow up will be critical. Make sure that you compose an effective thank you email message or letter as soon as possible after the meeting. Convey your strong interest in the job, a few reasons why it is an excellent fit and any additional information you may not have furnished at your meeting.